For a Limited Time we have mini packs of rods available at sale prices. 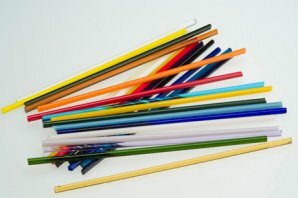 The perfect choice for lampworking and other hot glass work. The glass is expansion matched to COE 96 and is factory tested for compatibility with all of the System 96 family. Each glass has been carefully formulated to avoid devitrification even after holding in the flame for long periods. SPECIAL NOTE: Since Uroboros Glass has closed, production of System 96 Rods has ceased. Oceanside Glass and Tile has taken over the Uroboros product line and is expected to resume production of rods. Exactly when is the question, and we don't expect production to resume until later 2019. See something you like? Order it NOW! All 6mm rods are sold INDIVIDUALLY OR IN PRE-MIXED ASSORTMENTS. 6mm Rods are approximately 3/16 to 1/4" thick and 20" long. There are roughly 12 rods in a pound. We sell System 96 Rod by the individual piece rather than by the pound. We don't see the point of making you take a pound of bright orange rods when one will do. All 10 mm rods are sold INDIVIDUALLY OR IN PRE-MIXED ASSORTMENTS. 10mm Rods are approximately 3/8 to 7/16" thick and 20" long. There are roughly 3-5 rods in a pound. We sell System 96 Rod by the individual piece rather than by the pound. We don't see the point of making you take a pound of bright orange rods when one will do.